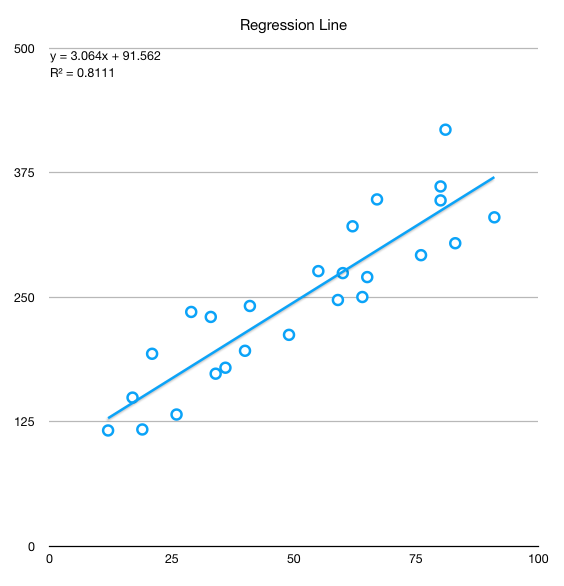 In several of my previous posts I wrote about linear regression, but in none I wrote about when and how to use it correctly and how to interpret the results. 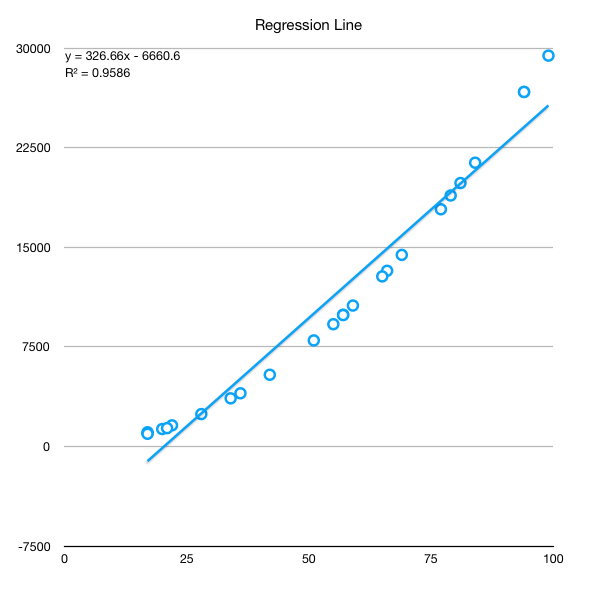 Computing a simple regression line is easy, but applying it blindly will surely lead to incorrect results. R^2, the coefficient of determination, is the proportion of the variance in the dependent variable that is predictable from the independent variable(s) and is defined by R^2 = Var(ax+b) / Var(Y). It is located between 0 and 1. 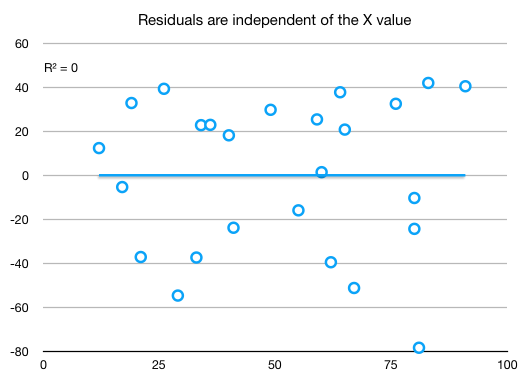 Low R^2, residuals not independent of X - incomplete relationship, there is something other factor to be taken into consideration. Let’s do an example in Excel. 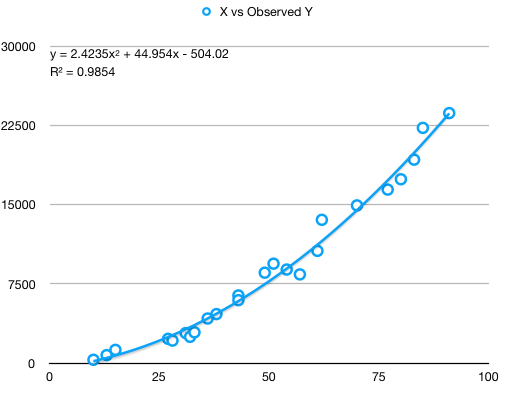 Let’s consider X = RANDBETWEEN(10,100) and Y = 100 + 3 × X + RANDBETWEEN(−100, 100). This leads to Y being in linear relationship with X with the paramenters b=100 and a=3. In Excel, slope (a') and intercept (b') are computed with the formulas a' = SLOPE(Y, X) and b' = INTERCEPT(Y, X). Running these lead to a'=3.06 and b'=91.56 and an R^2=0.81, where R^2 = Var(Regressed Y) / Var(Y) as noted before. This means that 81% of the variation of Y is explained by the regression model. More on the interval of confidence for these values later in this post. And then we inspect the distribution of residuals vs X. Should be highly uncorrelated. Lag 1 autocorrelation = 0.16 - low, but is low from a mistake. We should have sorted by X the data series before to see the real correlation. For small variations, up to 20%, the two formulas give almost identical results due to the mathematical properties of the natural logarithm. For higher variation, the logarithm shows excessive dampening of the values. 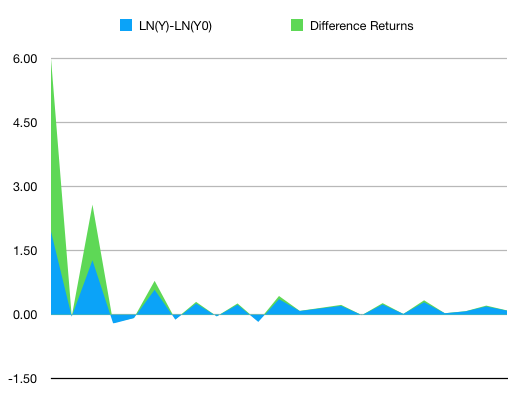 See the chart below for %returns for a series computed through both methods. Logging a series often has an effect very similar to deflating: it straightens out exponential growth patterns and reduces heteroscedasticity (i.e., stabilizes variance). Logging is therefore a “poor man’s deflator” which does not require any external data (or any head-scratching about which price index to use). Logging is not exactly the same as deflating–it does not eliminate an upward trend in the data–but it can straighten the trend out so that it can be better fitted by a linear model. Deflation by itself will not straighten out an exponential growth curve if the growth is partly real and only partly due to inflation. The logarithm of a product equals the sum of the logarithms, i.e., LOG(XY) = LOG(X) + LOG(Y), regardless of the logarithm base. Therefore, logging converts multiplicative relationships to additive relationships, and by the same token it converts exponential (compound growth) trends to linear trends. 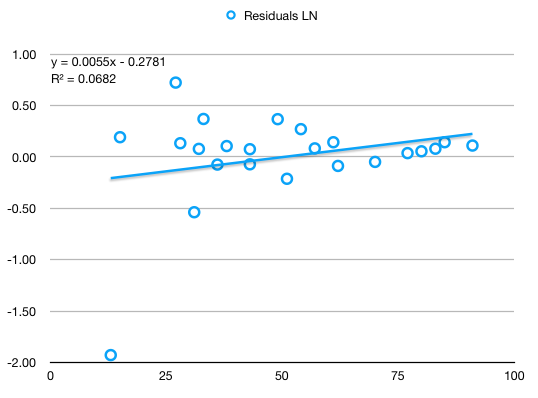 LN(X * (1+r)) = LN(X) + LN(1+r) ≈ LN(X) + r Thus, when X is increased by 5%, i.e., multiplied by a factor of 1.05, the natural log of X changes from LN(X) to LN(X) + 0.05, to a very close approximation. Increasing X by 5% is therefore (almost) equivalent to adding 0.05 to LN(X). Sort the series by the X term. Only doing this skyrockets the lag 1 autocorrelation to 0.75. 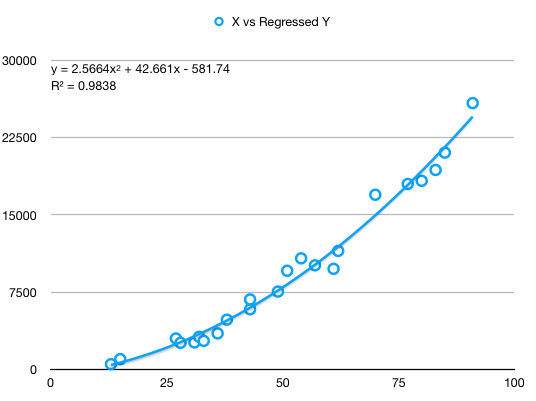 Do the regression on Y' = aX' + b, which basically say for an increase of x% in X, corresponds a linear increase of y% in Y, this being the reason for transforming both X and Y to percentage returns. 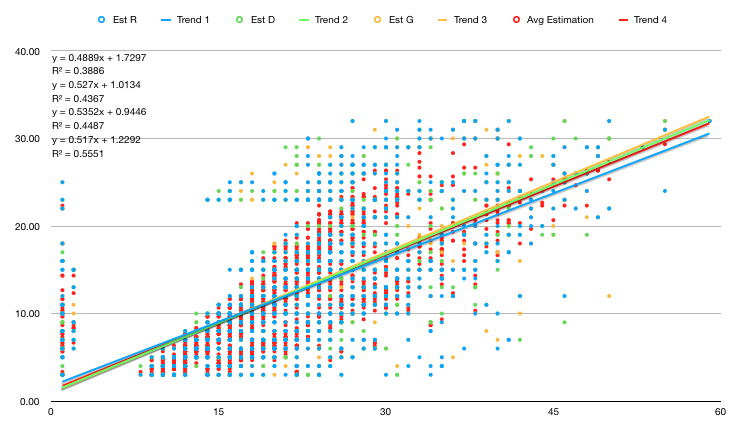 Reverting to initial scale (before the percentage returns transformation), residuals show a tendency to accumulate errors towards the right extreme. Residuals must be inspected in order to make sure the regression is correct and captures the underlying movement of data. Timeseries usually need to be transformed to percentage gains. Obviously, while the transformation towards percentage returns still tends to accumulate errors as X grows, it still captures much better the data. In the example above, a significant part of the increase in error is due to the way I generated the Y vector in the first place: Y = 3 * X * (X+RANDBETWEEN(-10, 10)) + RANDBETWEEN(-200, 200). Simply by using this formula, the errors increase towards the end because the generated (observed) data has proportionally more variation towards the end. As with any model, visual inspection of the end result is very important. Using the percentage gain obtained by difference will lead to slightly different results. A multiple regression is a function y = c0 + c1 * f1 + ... + cn * fn, a generalization of the simple linear regression described above. In Excel, the function to perform multiple linear regression in LINEST - attention, the returned coefficients are in reversed order. Explanation is simple. If the character is a male, c1 and c2 will be 0 thus leading to y_male = a1 + b1*x. If the character is femaile, c1=1 and c2=x, leading to y_female=a2 + b2*x. We may not want the slope influence to be reflected, but only the intercept. In this case, we would only add a single binary dummy variable. We can generalize this to k categories. To avoid multicollinearity, we will introduce k-1 dummy variables for intercept and k-1 for slope, if we want to consider slope as well. Assuming we want to fit a model that looks like Y = b0 + b1 * X + b2 * X^2 + ..., we can simply reduce it to multiple linear regression by selecting our features as X = [1, X, X^2, X^3, ...]. In this case, we should seriously consider scaling the features [X, X^2, ..., X^n] if we want our model to converge sufficiently fast. Given the multiple regression line from above, the points (xi, yi) for which we estimate the regression coefficients are just a sample of the total population of possible (xi, yi) pairs. Thus each coefficient, c0 ... cn, is normally distributed and we can estimate the mean and sigma for each of these coefficients. Obviously, the lower the standard error (SE) of each coefficient, the higher confidence we can have that that parameter is close to correctness. Now, what we have is a coefficient ci for each of the factors. The question is, is each of these factors relevant? Differently said, if ci == 0, that factor would be irrelevant. Now we need to see if ci == 0 is probable enough so that it cannot be discarded that is, if the ci for the whole population would actually be 0 (null hypothesis), how probable would it be for us to observe the value obtained from performing the regression? To answer the question above we compute what is called the t-statistic. t-statistic(ci) = ci / SE(ci). The t-statistic measures how many standard errors we are away from the mean if the mean were 0, that is if the ci coefficient for the entire population were 0. Closely related to the t-statistic is the p-value which quantifies the probability that we obtain for ci a value greater or equal to what we obtained through regression, provided that ci were actually 0. That means, we look for a very low p-value which corresponds to a high t-statistic in order to determine the relevance of this particular factor in the model. Equivalent to a t-statistic of 3 is a p-value of roughly 0.05% (3 deviations from the mean, two-sided p-value). How good, overall, is our model? That is, if all our regression parameters were 0, how far would our residuals be from residuals that would be generated from an intercept-only model. The F value in regression is the result of a test where the null hypothesis is that all of the regression coefficients are equal to zero. In other words, the model has no predictive capability. Basically, the f-test compares your model with zero predictor variables (the intercept only model), and decides whether your added coefficients improved the model. If you get a significant result, then whatever coefficients you included in your model improved the model’s fit. If all ci == 0, then the total variance of the residuals in this case would be the total variance of Y, which is the absolute maximum variance the model can have. 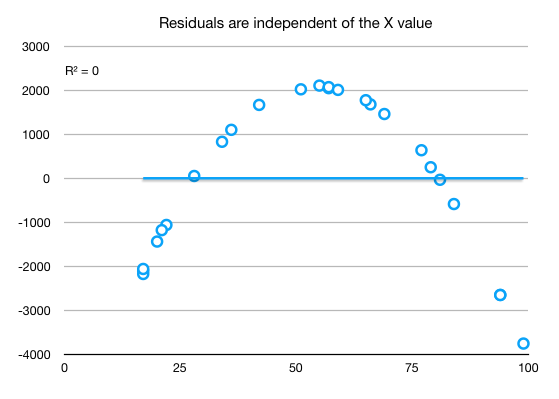 If our model were to bring value, then the variance of the residuals would be much lower than the total variance of Y. Just like the t-statistic, the f-statistic measures how far from the maximum variance our residual variance is, that is how far Var(Residuals) / Var(Y) is from 1. I have generated some data to create a regression model here. The data assumes a team of 3 people working on a software module, with 3 types of tasks: front-end, backend and data. As time passes, the complexity of the code base increase thus also estimations tend to increase. The data includes a measure for code complexity, the type of task, initial estimation given by each developer, which developer worked on each task (there is an affinity for developers for task types, but not 100%) and what was the final duration. We want a model which aims to predict the final duration of a new task. The data is chosen in such a way that it presents multicollinearity and categorical components. First step is to see if maybe a simple regresion based on the average estimation given by developers is enough. 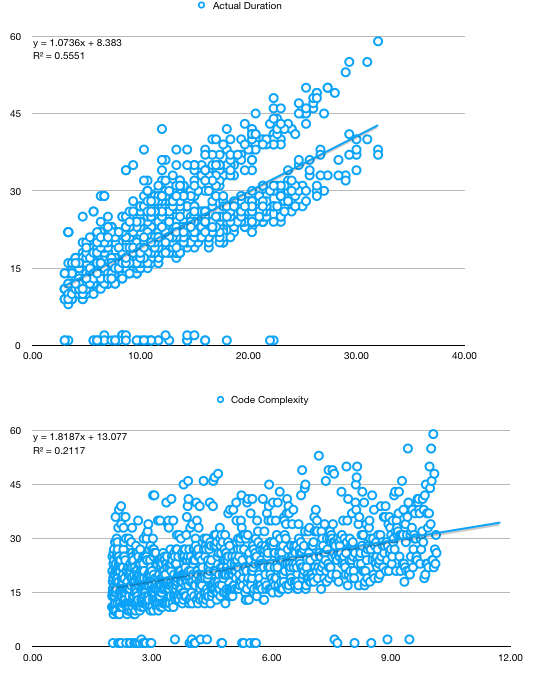 We notice than, while the trend in task duration correlates with both average estimation and the code complexity, neither are good predictors - rather low R^2 in both cases as well as two divergent trends in the first chart. 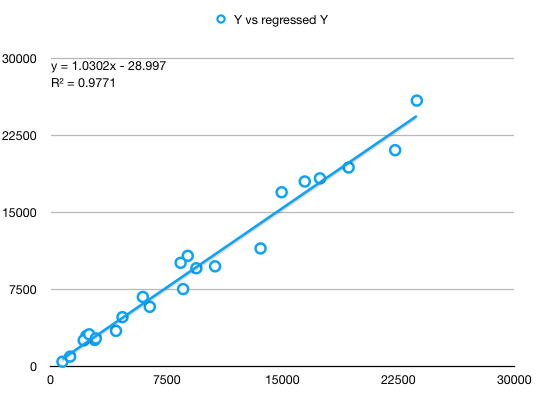 Both elements hint towards more factors needed to be included in the regression. A second step, which we will skip now, is to analyse the duration based solely on time. If we were to do this, we would have to switch to percentage returns to remove the trendiness in data, as explained in a previous section. The third step is to analyse muticollinearity. When we start scatter-plotting one variable against the other, we notice very strong correlations - note that, for estimations, they are from the start based on Fibonnaci numbers, thus the several parallel lines instead of a cloud of points. From the multicollinear variables, seems the “Average Estimation” explains the best the variation in duration, thus we will keep it and discard the rest. we don’t include also the Worked R, D slope dummy because they highly lag 1 autorrelate to Frontend task and Backend task.
""" Number of factors DOES NOT include the intercept """
It is obvious that except some outliers the residuals are quite normally distributed. However, they have a trend upwards which should be investigated. It also is quite obvious that the results of the regression are not far from the observed data. This is numerically highlighted also by the rather high R^2 and adjusted R^2. Coefficients are a little bit strange though: 17.674954 -0.244873 -1.934692 0.933654 0.383172 -0.031911 -1.19284. A high intercept and a negative correlation with the number of incidents. 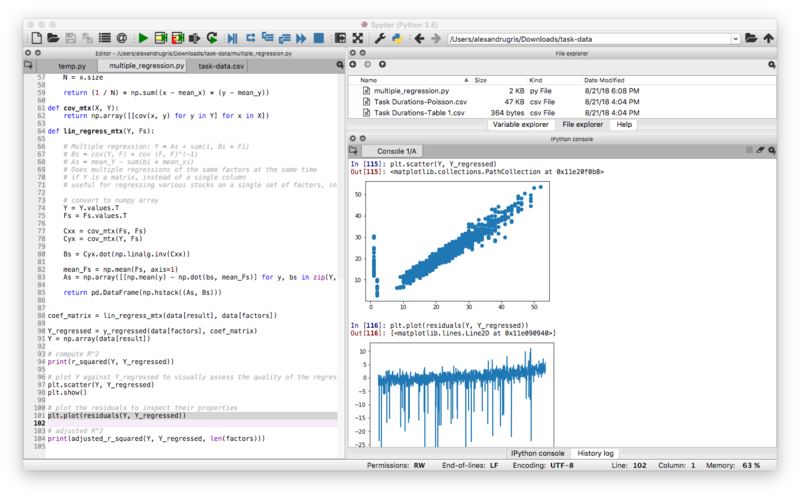 The number of incidents is selected to be Poisson distributed with a mean of 5, no matter the code complexity. This, together with a high margin of error in the way the Inverse Poisson was computed in Excel which leads to a predisposition towards lower numbers, might be interpreted as “as the code complexity increases, the team becomes less confident in its ability, but still finishes faster than their too pessimistic estimates”. The extra average added by the incidents is included in the intercept, while the predisposition for lower numbers is included in the negative factor for the incidents.